Min. 2 nights. Max. 6 people. 2 Villas currently available. 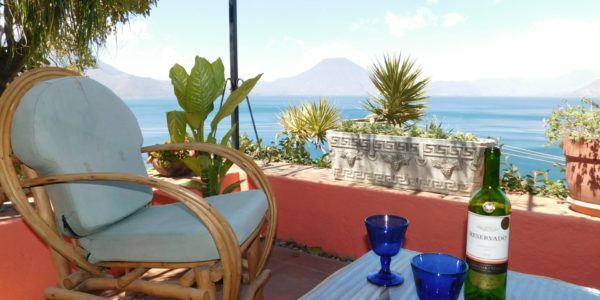 Two gorgeous, 2-Bedroom, 3 Bathroom Villas are available for Lake Atitlan vacation rentals. They are on a large property that runs from the road down to the beach front with a colourful garden running between the 5 Villas on the property. Two further villas will be available shortly. Situated near the public dock of one of Lake Atitlan’s most colourful Mayan villages, Santa Catarina Palopo. Suenos de Santa Catarina is a new complex of comfortable and cosy, well-equipped vacation rentals with 2 bedrooms, 3 bathrooms, but can sleep up to 6 people with a sofa bed in the living room. Each Villa is equipped with everything you might need for a couple of nights through to a monthly rental. Right in the centre of Santa Catarina, they are in their own garden oasis with views of the volcanoes and direct access to the public beach. Each Villa has two floors. The ground floor is open plan with a living room with fireplace and sofa bed, then to the other side a fully-equipped modern kitchen and comfortable seating area for 6 people. Under the stairs is a full bathroom with shower. Sliding doors lead from the kitchen to a semi-covered outside Terrace eating area. Upstairs are two spacious double bedrooms each with their own bathroom with bath tub! Both bedrooms have access to the wrap around balcony that offer wonderful views across the property to the spectacular volcanoes of Lake Atitlan beyond. Each villa is equipped with a washer/dryer and have access to 1 parking space. We can take requests for a second car space depending on availability. However, there is parking in the town too. Each villa is the same. If you wish to book the other Villa too, just let us know. The villas can be rented by the night (min.2), the week (7 nights for the price of 6! ), and also by the month. Please contact us for prices. There is a hotel next door which generally allows access to the pool if you buy lunch or else they will charge a small daily fee. Holidays and festival days may be different. The guardian, Juan, is on site to help you with any needs you might have during your stay. There is also an armed guard during the nights for extra security. If communication needs to be in English then the Bookings agent, Mayan Lake Realty, can help you out. Each villa is private to guests. The gardens and pathway down to the public beach are shared amongst the Villas. Please note this is not a party house or complex. We ask guests to be respectful of other guests and to please keep an eye on their children during their stay. No pets. Santa Catarina Palopo is one of the 12 lake-side villages of the famous Lake Atitlan. It is on the eastern side of the Lake just a short 20-minute drive by car from the commercial and transport hub of the Lake, Panajachel, better known at Pana. It is a small Mayan village which is distinctive due to the beautiful blue coloured ‘traje’ of the Mayan locals (traditional costume). This village is also one of the few in the country where many men still wear the traditional traje too. The village recently hit the international news due to a fantastic idea of painting the local buildings in the bright colours that resembled the Mayan traje and traditional weavings. As more and more buildings become painted, the town is turning into a living, breathing work of art! All the brain child of a Guatemalan journalist, Harris Whitbeck, who was inspired by a similar project in a poor, urban area of Rio de Janiero in Brazil. It is a small, quiet, non-touristy village. As a result it is not geared towards tourists in that there are no bars, cafes or restaurants – these are all in Panajachel, about a 20-min drive away. Here you will also find the public docks for the public and private boats to other villages around the lake. For further information, to check availability and/or book, please contact us.